The 16 Days of Activism Working Group joins in hand with the world to raise awareness on Elimination of Violence Against Women with different activities –“Forever White Ribbon”- Film Festival, Fun & Learn Quizzes, Songs and Role-play performances, Booth displays, and many more. The purpose of organizing Film Festival and 16 Days of Activism this year is to raise public’s awareness on Elimination of Violence against Women, and that in order to enact a Law on Preventing Violence Against Women through films inspired by current issues. On account of this, we invited short films and documentaries that reflect gender equality or elimination of violence against women by film-makers across Myanmar to be screened and participate in the coming Film Festival. 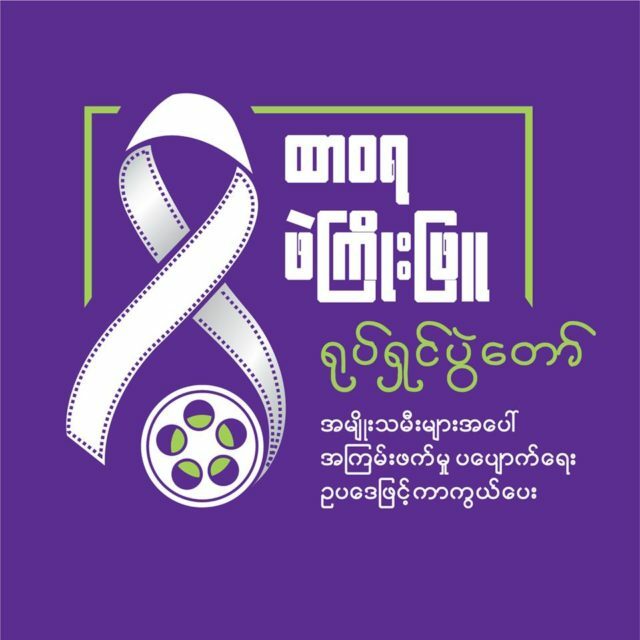 Between November 25th to December 10th, Forever White Ribbon Film Festival and Awareness Raising Campaign will be held in other major cities including Yangon. The closing and awards ceremony will be in Yangon on 11th December.